Plans for ID cards are in turmoil as the government gears up for Tuesday's vote on the issue, the shadow home secretary David Davis has said. The cards are "unnecessary, unworkable and unlikely to make our streets and communities safe", he says in the Mail on Sunday newspaper. But minister Patricia Hewitt said the cabinet had had "lengthy discussions" and it was the right thing to do. 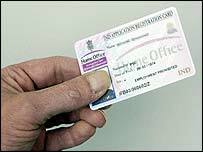 A second reading of the Identity Card Bill is due to take place on Tuesday. Health minister Mrs Hewitt, a former chairman of the National Council for Civil Liberties, told Sky News the cards could be used to "deal with the growing problem we have got with identity theft and fraudulent use of benefits and other services". The Commons vote comes days after Home Secretary Charles Clarke dismissed claims that the cards would cost £300 to buy - although he did concede the official estimated cost of £93 was "merely indicative". Tuesday's vote will be first test of MPs' opposition to the bill since it was abandoned before the general election. Then, 19 Labour MPs rebelled over the issue. The Conservatives and Liberal Democrats have both pledged to vote against the proposals in this parliament. But BBC political correspondent Reeta Chakrabarti said rebels did not think a government defeat was on the horizon, although they did want to press their arguments against the bill. Mr Davis said: "In Labour's Britain there is a sense that we are all now guilty until proven innocent. "As if to reinforce this point, they now want us to carry around a plastic card with our name, address and photo on it so we can prove who we are at all times. "It represents an unhealthy shift in the balance of the relationship between the citizen and the state." The cost of carrying a card was "another stealth tax", he added. The Home Office predicts the total cost of running the scheme, in conjunction with a new biometric passport system, over 10 years would come to £5.8bn. Mr Davis said the money could be "better spent". He said: "It would, for example, cost just £26m to introduce proper checks on people entering and leaving the country through our ports." Lib Dem home affairs spokesman Mark Oaten said the ID cards bill was in "tatters" and urged backbench Labour MPs to side with the opposition parties. "The public never forgave the Tories for the poll tax. If this measure makes it onto the statute book, they will soon come to loathe Labour's identity tax in equal measure." Labour rebel Bob Marshall-Andrews said there was a "very heavy groundswell of opinion" among MPs against the bill. He predicted between 20 and 30 Labour MPs would sign up to a rebel amendment to the bill. Speaking on GMTV's Sunday programme, the MP for Medway said the scheme would be a "failure of Dome-like proportions". "It is going to be a national scandal," he said. Several unions also attacked the government's plans to introduce the cards. The Transport and General Workers' Union and Public and Commercial Services Union both voiced their opposition. But the Public and Commercial Services Union, which would be expected to oversee the scheme, said it would cause "great alarm" if the administration of ID cards was outsourced to private companies.